NETWORK FINALS: Both reruns of THE GOLDBERGS lost 0.1 in final numbers. CABLE HIGHLIGHTS: The season premiere of USA’s THE SINNER was at 0.31, down 0.11 from the 2017 premiere (and down 0.46 from the Season 1 finale), but up 0.07 from its SUITS lead-in, which was itself up 0.02 from last week. The series finale of History’s SIX ticked down to 0.17. 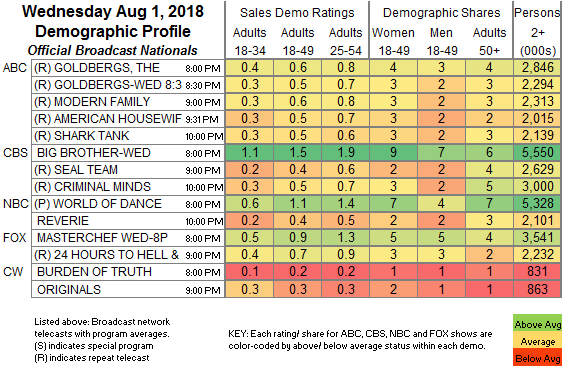 The season premiere of Freeform’s ALONE TOGETHER was at 0.07/0.06. If the end of the world didn’t already appear to be upon us, the ascendance of TLC’s DR PIMPLE POPPER to the top of Wednesday cable may herald it, up 0.09 to 0.63. Bravo’s REAL HOUSEWIVES OF NYC slipped 0.02 to 0.50. On VH1, BLACK INK CREW dropped 0.09 to 0.46, followed by the season premiere of MARTHA & SNOOP’S POTLUCK DINNER at 0.24/0.24. Paramount’s YELLOWSTONE gained 0.05 to 0.38. On HGTV, PROPERTY BROTHERS rose 0.07 to 0.33, HOUSE HUNTERS INTL ticked up to 0.27, and HOUSE HUNTERS FAMILY was at 0.26. Nickelodeon’s late-afternoon LOUD HOUSE continued to perform at 0.29 for a #7 ranking. On MTV, CATFISH fell 0.09 to 0.29, with the TROLLS lead-out hour down 0.03 to 0.26. Fox News’s HANNITY led cable news at 0.28/0.53/3.4M, with MSNBC’s RACHEL MADDOW SHOW at 0.26/0.41/2.6M, and CNN’s ERIN BURNETT OUTFRONT at 0.24/0.31/1M. TBS’s FULL FRONTAL ticked down to 0.28. On Food Network, GUY’S GROCERY GAMES lost 0.03 to 0.26. On ID, REASONABLE DOUBT dropped 0.04 to 0.26, and BROKEN TRUST was steady at 0.26. 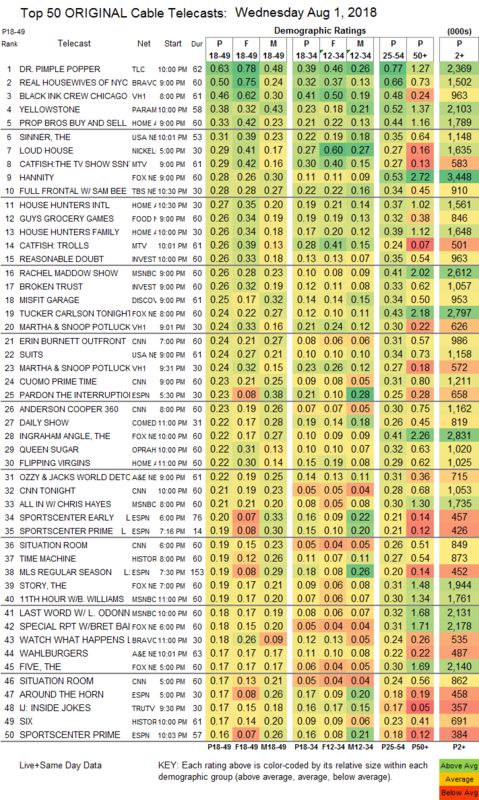 On Discovery, MISFIT GARAGE returned at 0.25, and GARAGE REHAB was at 0.18. OWN’s QUEEN SUGAR edged up 0.02 to 0.22. On A&E, OZZY & JACK’S WORLD DETOUR ticked down to 0.22, and WAHLBURGERS was up 0.02 to 0.17. Lifetime’s SEATBELT PSYCHIC was at 0.10, compared to last week’s 0.11/0.10. El Rey’s LUCHA UNDERGROUND ticked up to 0.03/114K.